8 SD Stereo Audio + CVBS inputs, and 1 ASI INPUT for feeding in local programs/services. MPEG2+MPEG4 ENCODER, and ASI PID Filter, PID Editor, and RE-MUXER. Digital RF, IP and ASI outputs. Audio/VIDEO 8 x SD CVBS video + Audio Left + Audio Right. 12 x BNC 75 Ω female. 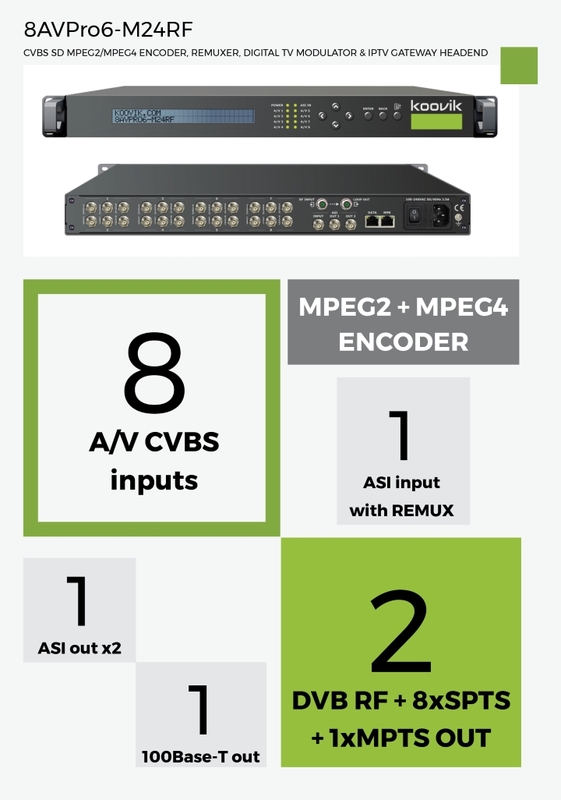 VIDEO CODEC MPEG2 + MPEG4 AVC H.264. High and Main profile. BIT-RATE Min: 0.5 for H.264 - 1 for MPEG2. Max: 15 Mbps. CBR or VBR. Selectable per each video input. IP MPTS 1 MPTS with 8 x CVBS TS over UDP or RTP/RTSP REMUXED with ASI. Unicast or Multicast. ASI 1 x ASI ( 2 mirrored ASI outputs ). ASI input REMUXED with 8 x CVBS TS. BNC 75 Ω female. included 1 x mains cable, 1 x ground cable, 8 Tripple BNC male to RCA male + 2 BNC male to BNC MALE.